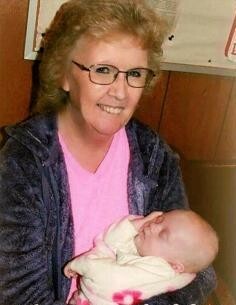 Sharon Rose McCracken, 62, of Dawn, MO, passed away Monday, August 6, 2018 at her home in Dawn surrounded by her family. On May 11, 1974 she married Darrell Wayne McCracken of Dawn MO. He survives of the home. Sharon was a homemaker and worked at Midwest Glove Factory for many years. She loved living in the country with her husband Darrell and she really enjoyed spending time with her family and going shopping. She attended Dawn Baptist Church and Blue Mound Cowboy Church. Sharon is also survived by her son, Danny McCracken of Avalon MO; one daughter Angela Jackson of Kansas City MO; 5 grandchildren; and 1 great grandchild; two sisters, Bev Plaster of Ludlow and Kathy Linville of Warsaw; three brothers, Bob Sayers of Chillicothe, John Mills of Ludlow and Kenny Mills of Chillicothe. She was preceded in death by her parents and two brothers, Larry Mills and Wayne Mills. A burial will be held at Blue Mound Cemetery on Friday, August 10, 2018.